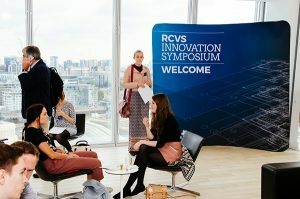 More than 100 people gathered at the Warwick Business School on the 17th floor of The Shard in London on 20 September 2017 for the inaugural RCVS Innovation Symposium. 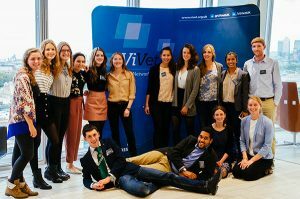 The invited audience included vets, entrepreneurs and Vet Futures Student Ambassadors, as well as the winners of an RCVS social media competition to find the best innovators in the veterinary and veterinary nursing professions. Welcoming all those attending, Chris Tufnell, RCVS Senior Vice-President, said that the symposium represented the culmination of many months of work. Its aim was to highlight how rapidly technology was changing the way services were being delivered and to encourage the veterinary professions to consider how they might embrace that future. It was time to engage wholeheartedly with the availability of data and technology to deliver animal health and welfare in innovative ways, he said. Speakers at the meeting examined innovation from all angles – from its huge potential for good, as well as its potential to disrupt or radically change existing ways of delivering services. They considered the process of innovation and how regulators might support it. Delegates also had the chance to put questions to two panels of innovators and entrepreneurs and to learn about cutting-edge technological developments. Among the key messages to emerge from the day was that innovations in technology will affect everyone and that the current pace of change is unprecedented. It was made clear that no individual or profession will be immune from the impact of innovation or its potential to disrupt. Delegates also heard that, with consumers increasingly expecting services to be delivered in new ways, it was vital for the veterinary professions to determine what unique value they offered and to consider how best to deliver it. The importance of the professions engaging with technology was stressed and a warning given that, if they did not engage, they would be sidelined and innovation would occur around them. The benefits of innovation were emphasised, with, for example, speakers highlighting how telemedicine has the potential to dramatically increase the reach of human and veterinary healthcare services, how technology can facilitate service delivery, and how big data analysis can improve outcomes. 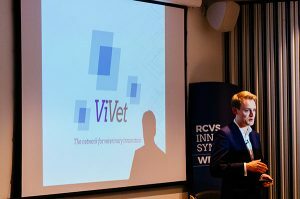 The RCVS used the occasion to launch ViVet, a wide-ranging programme aiming to foster innovation for the good of animal health and welfare. The initiative will help showcase innovative products and business models and will provide a range of resources and guidance to help those already innovating in the veterinary sector, and new entrants to it, navigate the regulatory landscape. It will also enable the RCVS to gather market intelligence and gain insights into the animal health market and how it is evolving. Concluding the day, Dr Tufnell said that vets must recognise that they were in the centre of animal health and welfare, not at the centre. Many other individuals had an interest in the field and wanted to do good, he said, and it was time all parties worked together.